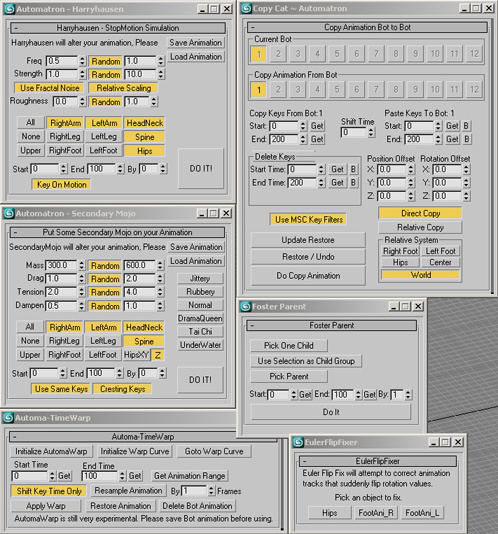 Automatron has a growing collection of special keyframe tools that affect your animation in different ways. CopyCat ~ This tool allows you to copy keys from one Bot to another in direct or relative modes. You can shift time, position and rotation. This is an easy way to edit your animation on a grand scale. For instance, you can load in multiple copies of the same character rig and copy and paste animation from one to another. You can also this to simply shift time on one characters animation or rotate the entire or parts of the animation in a different direction. You can even filter out parts of the animation and just use the upper body or hand keys. Secondary Mojo ~ You can add secondary springing to your rigs animation without having to add a hundred controllers. Harryhausen ~ Make your character animation look like stop motion. This adds a little noise to the animation only when its moving. Foster Parent ~ A simple tool that fakes parenting. There are many ways in Automatron to have a character animate its parenting with the IK blending system. Foster Parent is a quick simple way to temporarily re-parent a group of objects by keyframing the relative offsets over time. AutomaWarp ~ Retime your animation by shift the keyframes with a curve or re-sample your animation and have it run backwards, forwards, super slow of super fast.